J/News Articles: Winter Boat Show 2018 Calendar! 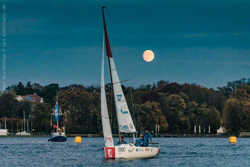 Dreaming About Summer Moonlight Sailing? Visit Winter Boat Shows! (Newport, RI)- With old man winter rearing his ugly head after the holidays, the USA/Canada and Europe are beset by a series of ferocious winter storms. It’s a great time to dive indoors to a large, warm, exhibition hall and visit J/Boats dealers participating in winter 2018 boat shows to get the latest information and scoop on the newest offerings from J/Boats. Here is a list of them to add to your future travel plans! With over 300 sailboat related exhibitors, there is no question the world’s largest sailboat show in the heart of Europe is an exciting place to visit. Das boot, the boat show in Dusseldorf, Germany, takes place from January 20th to 28th, 2018. On display in Hall 15/ Booth B21 will be three choices for J/Tribe aficionados. For those into performance, the new J/121 Offshore Speedster will be making her European boat show debut; learn why she was chosen SAIL Best Boat- Performance Over 30 feet Award and SAILING WORLD’s Boat of the Year- Best Crossover Award. And, check out those new fast, comfortable sport cruisers- the J/97E and the J/112E. The next-generation sport-cruisers, the “E” series of the J/97E and J/112E, are proving to be quite popular in Europe. At the Paris Boat Show, the J/112E had an enthusiastic reception with sailing families seeking to combine the “joy of sailing” with lots of expansive comfort on deck and down below in the sunny interior. For more Boot Dusseldorf show information. For a week, you get a chance to escape the lovely grey, drizzly weather in the Pacific Northwest and pretend it is always sunny, warm, and pleasant by going inside the pavilion at the CenturyLink Field Event Center. Visit Booth WEST 4 to see the easy-to-sail 31 foot sport cruiser that has been taking the European offshore buoy events by storm- the lovely and incredibly roomy J/97E. On hand to help you chat about the 97E and the latest in the J/Boats range (like the new J/121 Offshore Speedster) will be the team from SAIL Northwest. For an appointment, please call Bob Ross at SAIL NORTHWEST- ph (206) 286-1004 or email- bob@sailnorthwest.com. For more Seattle Boat Show information Add to Flipboard Magazine.